Tag Tuesday: Beauty Scenario Tag! 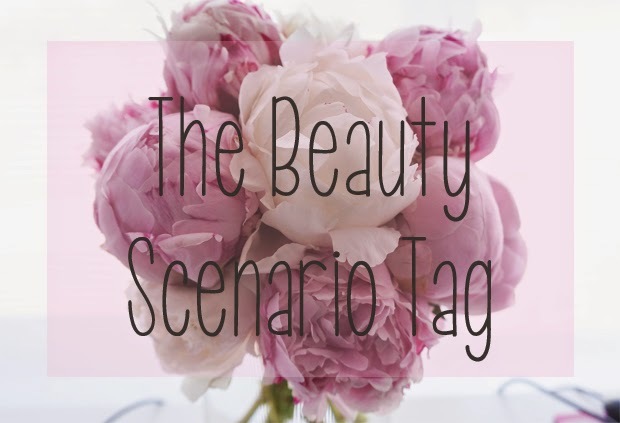 It's that time again and this weeks tag is the Beauty Scenario tag! I saw that Jenan over on La Vie En Mauve had recently completed this tag and had asked anybody reading to take the tag themselves so of course I had to give it a go! I don't have many high end foundations as I don't see the point in wearing expensive products just to wear for work. The one foundation I would definitely keep would be the Rimmel Stay Matte Liquid foundation. It's my go-to foundation and one I would not like to be without! I personally wouldn't say anything because if I was in her place I would be absolutely horrified! and I know it sounds stupid but I wouldn't want it to affect the interview in anyway. Obviously if it wasn't going well, why not? 3. You go back in time for a day to your teenage years, how would you do your hair or makeup differently? I would tell myself to stay away from the glitter. That includes eye shadow/mascara/eye liner/lip stick/hair mascara/body spray and even hair glitter spray. It was clearly cool in the 90's to go walking around like a human disco ball! 4. You ask your hairdresser for a shoulder length pixie lott hair cut but they hear wrong and a give you a pixie cut instead. What do you do? c) Complain to the manager and demand a refund. Probably a bit of B & C although to be honest, as soon as I saw her cutting off more than what I wanted I'd probably start the crying. I'd like to say I wouldn't be that bothered as it's just hair and it can always grow back, but super short hair looks terrible on me so I know I wouldn't pretend to like it when I definitely wouldn't ask for it! 5. Your friend surprises you with a 4 day city break and you have one hour to pack, which "Do it All" palette do you pack in your makeup bag? I don't really have a "do it all" palette and I tend to like a few products from different brands so unfortunately my friend would have to just wait while I packed! 6. Your house has been robbed, don't worry everyone is safe, but your beauty stash has been raided. Whats the product you really hope is safe? To be honest I don't think I'd be too panicked. All of my make-up is high street so I could easily go out and replace them. Does that make me a bad beauty blogger or just super laid back? Urmm D because I would never lend my make-up to my friends in the first place. I don't think it's very hygienic to share things like make-up and I even get a little funny when my own mom uses my lip balm. Hope you enjoyed this tag and feel free to tag yourself for your own blog! This was a really nice read with my morning coffee, thanks lovely :) I definitely remember the days of walking around like a disco ball (unfortunately) haha! Great tag and answers. I, so can rely to #4, I would gonna kill her, lol or even better I would chop her hair off. Lovely blog here btw! Would you like to follow each other on GFC? Please let me know on my blog so I can follow back. Thank you. Haha I didn't think of that! Revenge hair cut is a good idea! LOL! I just did this tag myself, it was fun because the questions are different from the other tags! Love reading your answers and lil eyou, my makeup are mostly drugstore so I wouldn't be too worried about it. This is a fun post. I like it.